Region Code: 0 (worldwide) · Sound Format: Dolby Digital 5.1 · Running Time: 75 min. Holy John Chrysostomos“ and the Morning and Evening Rejoycing, also known as the Vesper. The Vesper was Rachmaninov’s last work to be composed in Russia, but it eventually fell in disgrace with the new Comunist leaders. 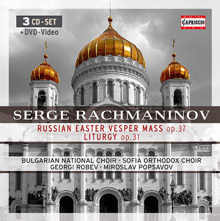 Even the first disk recording in Moscow in the year 1965 was only produced for foreign markets; the own polulation was not allowed to listen to this kind of religious music.